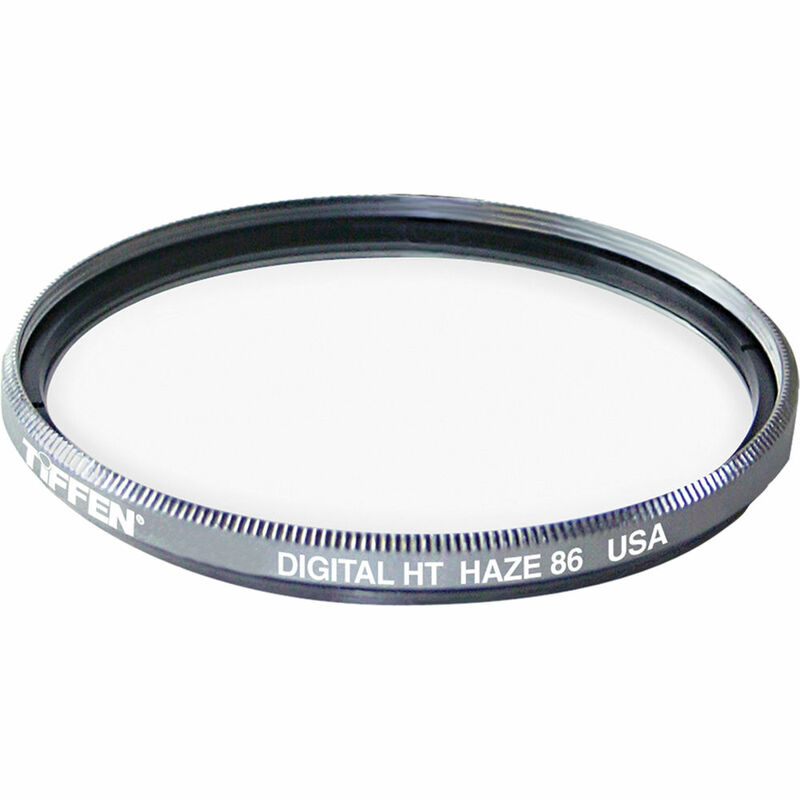 The Tiffen 67mm UV Haze 86 Digital HT Filter is a general use, clear filter that helps to absorb 86% of ultraviolet light and reduce the bluish cast of daylight. This is especially useful when photographing at high altitudes or around bodies water. No additional coloration or contrast is provided, allowing you to pair this filter with others. The Digital HT coating is a high transmission multi-coating that surpasses military specifications for hardness and durability. This optical purity combined with high scratch-resistance results in an easy-to-clean filter with superb imaging quality. They also feature titanium filter rings for increased strength and durability. Absorbs 86% of UV light and reduces bluish cast of daylight. Digital HT multi-coating provides increased strength, durability, and optical clarity for greater light transmission and protection against scratches. Box Dimensions (LxWxH) 4.2 x 4.1 x 1.0"
67mm UV Haze 86 Digital HT Filter is rated 5.0 out of 5 by 8. Rated 5 out of 5 by Bruce from Clearly an excellent filter Like many photographers I added a UV filter to protect my lens. What I desire most, is to be able to say it does not affect my pictures at all, since I leave it on my camera all the time. The Tiffen HT series are expensive filters but are well made, easy to keep clean and the equal of any filter made. It does not make sense to me to buy an expensive camera with a sharp lens and then put less than the best filter I can afford on the front of it. Rated 5 out of 5 by Marty K in NJ from Superb HT filter for Digital SLR I couldn't be happier with this product. I'd purchased an inexpensive UV filter at the local camera shop, but was very disappointed in the results. The multicoating is key, as noted by others, but the high transmission quality is also essential. I'm able to shoot at smaller apertures with faster shutter speeds now. Great!! Rated 5 out of 5 by Brent from The Best Filters! These Tiffen HT filters are nearly invisible! The effect on exposure settings is minimal, which is especially useful in low-light situations. These filters are relatively more expensive but if one is going to make a serious investment in lenses, it only makes sense to only use the best filters. And, Tiffen filters are made in the USA! Rated 5 out of 5 by Anonymous from Digital HT Haze Filter Great product, Very high quality filter. Also great service from BH photo of course. Rated 5 out of 5 by Oldrollei from Well-made and sturdy Thin profile avoids vignetting. Previous Tiffen filters have held up well. Rated 5 out of 5 by Anonymous from great for eliminating haze Perfect for shooting in China.